The long list below shows most of the surnames (and patronymic names) that appear at least three times in CRARG’s projects that include Praszka (Prashka), which is one of our core towns. The number indicates how many times the name appears. Records for persons from this town can also appear in projects for other towns, especially in marriage records and records for non-permanent residents. 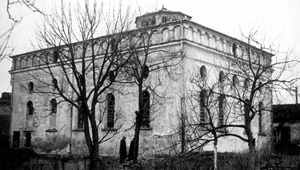 During the 1700s, the Jews of Praszka belonged to the Jewish community of Działoszyn. The town of Praszka consisted of more than 50% Jews by the end of the 1800s, with a total Jewish population of nearly 2,000. The town was occupied by the Germans in September of 1939. A ghetto was set up, and Jewish residents from Wieluń and Wieruszów were transferred to the ghetto as well. Later, Jews from the ghetto were taken to a forced-labor camp in Przedmoście and to the Chełmno extermination camp. For Praszka (and nearby towns), some data will be in our Holocaust records, but the vast majority will be in our pre-Holocaust records.